Click on a heading / question to find out more information about the Taxbriefs web quoting and ordering process. If you don't find the answer to your question here, please call us. What is the Essential Service? The Essential Service is our most economical option. We offer you a cost saving by printing your personalised section in black and white. Your firm's logo and details will appear in black on your newsletter (included in the price), and you can include a black and white image by your address (for example, of your staff or premises). Which designs are available in the Essential Service? All four designs (Bulletin, Review, Financial Focus and Money Wise) are available in the Essential Service. Call us for a free samples pack. Why can't I have my logo in colour under the Essential Service? We are able to offer savings on the Essential Service by printing your personalised section in black and white. Colour printing of logos is only available as part of our Tailored Service due to the higher costs involved. What is the Tailored Service? - change the newsletter title to one of your choice. Which designs are available in the Tailored Service? All four designs (Bulletin, Review, Financial Focus and Money Wise) are available in the Tailored Service. You can alter the look of these designs by changing the newsletter's title and having the banner in your corporate colours. Call us to discuss how you would like to tailor your newsletters. We have a range of designs to suit you, whether you prefer a traditional or more contemporary look. 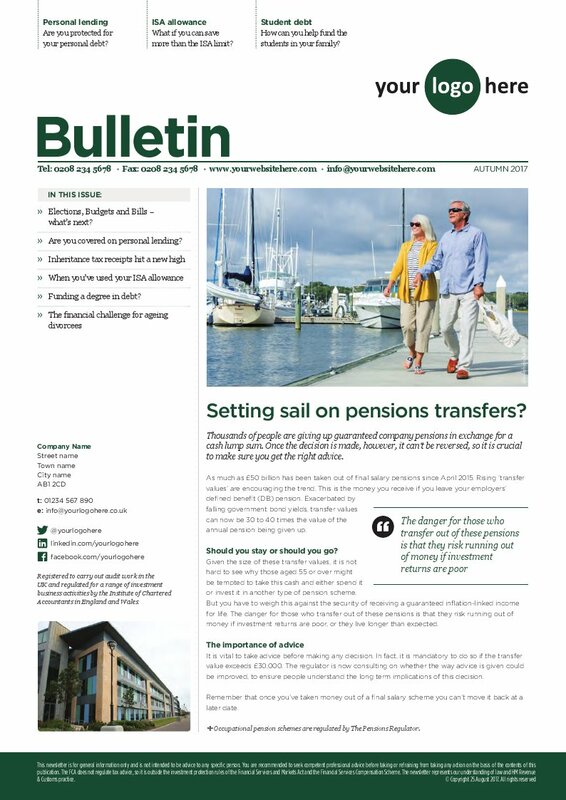 The Bulletin and Review designs are both 4-page, A4-size traditional newsletter designs with a choice of front page layouts, titles and banners. 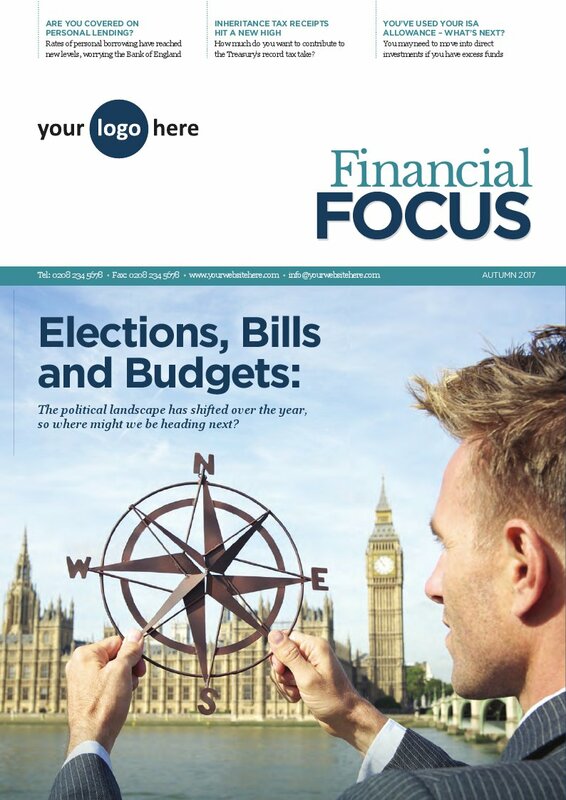 Financial Focus is 8 pages long with an A4, magazine-style layout. 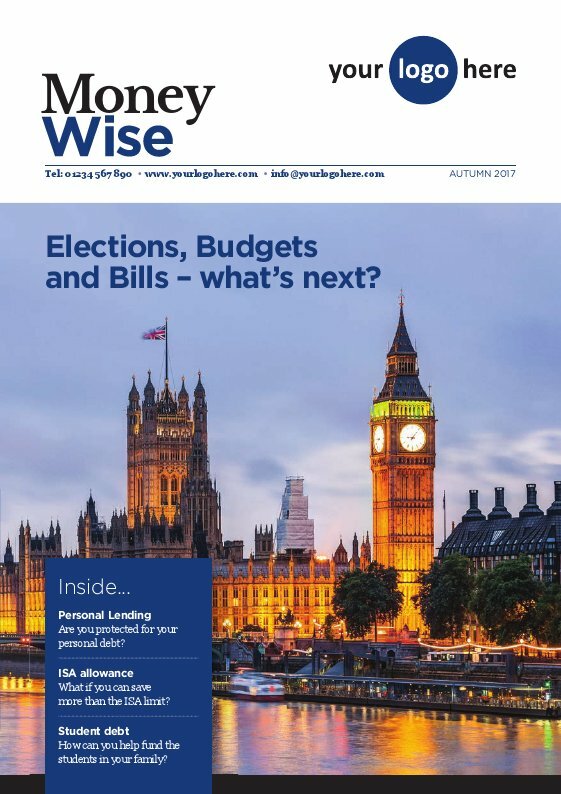 Money Wise is a contemporary format A5 publication, which has a lower postage cost than the A4 formats. Call us for a free samples pack. Why do the colours change between editions for Newsletter and Journal? We use a seasonal colour theme for Bulletin and Review (ie spring (green), summer (red), autumn (purple) and winter (blue)). Can I change newsletter designs? Yes. You can change newsletter titles, as long as you have not already approved your proof. There may be a small charge to cover the new personalisation. Call us to discuss this as soon as you decide to change your order. What size are the newsletters and what do they weigh? Bulletin and Review are 210 x 297mm, 4 pages long and weigh 22g. Financial Focus is 210 x 297mm, 8 pages long and weighs 32g. Money Wise is 148 x 210mm, 8 pages long and weighs 21g. What will be in the next edition? 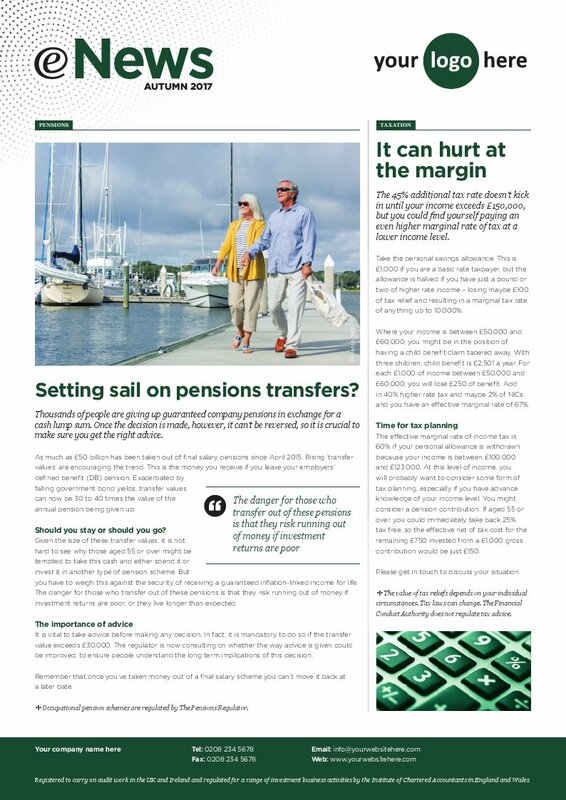 See this edition's content on our IFA newsletters page, or give us a call for the draft contents. I would like to add my own content, how do I do this? You can include your own article on the cover under the Tailored Service. If you would like more bespoke options please call us to discuss what you would like. Can I see free samples? Yes, just call client services on 020 7970 4142 and we will provide you with a free samples pack. The cost will depend on which service and extras you would like. . You can save on your order by signing up for a subscription, and further discounts apply if you are ordering more than 500 copies. Call us for an obligation-free quote, or you can complete our online quote request form. - Send an email to clientservices@taxbriefs.co.uk detailing your requirements. All orders need to be confirmed in writing. We also need a copy of your firm's letterhead paper and your logo in Illustrator .eps (encapsulated postscript) format. Who will look after my order? When you place your order you will be contacted by your account manager, who will take you through every aspect of the service and will be on hand to answer any queries you may have. What will I receive from you when I send in my order? When we receive your order, we will send you a sales order confirmation by email within a week confirming your order details and the cost. Shortly afterwards we email you a proof of your personalised section to approve. Printed copies will be sent by courier and will need to be signed for. Digital versions will be sent to you by email. You will receive a VAT invoice on despatch. For future editions we will email you a renewal pack, containing details of the forthcoming edition and a new proof to sign off. We won't produce anything until you have confirmed you are happy with how your personalised section is presented. Why do the first 200 copies cost more? The price of the first 200 copies covers all the production costs, including processing your order, generating and checking your personalised artwork, preparing the files for production, the cost of readying the press and checking the printed personalisation. These initial costs are not incurred again for additional copies ordered in excess of the first 200 copies. Yes, until you approve your proof we can accept changes to the number of copies ordered and these will be charged at the extra copies price (please confirm changes to your order in writing). If you have approved your proof and your artwork has already been printed, it is possible that higher production costs may apply. I have ordered before, do you still have my details? If you have ordered within the last few years it's likely we have your personalised artwork and details on file. Just give us a call and we will check for you. We will send you a schedule, but it's best to place your order as early as possible to ensure you don't miss any deadlines. We need approval in writing of your personalised section before we can put your order into production. We may still be able to accommodate an order, though if you have not approved your proof by the artwork approval deadline your copies will be subject to late delivery and you may incur extra production costs. You can pay by Direct Debit, credit card, BACs or cheque. Subscription costs can be spread over the year by paying monthly on Direct Debit. A sales order confirmation will be sent on receipt of your order. You can pay this on receipt and then we send you your sales invoice. A VAT invoice is supplied on despatch of your order. I need to cancel my order, is this possible? If you need to cancel your order, confirm this in writing and we will arrange this for you. You will be charged on a 'time and materials' basis for whatever work we have already completed on your order. A copy of our terms and conditions is available on request. By taking a quarterly subscription you can save significant amounts on your newsletters and it also means you need only confirm your order once for the whole year. We will still send you a proof every edition to sign off. I want to change my order, but I'm in the middle of my subscription. How do I arrange this? Just confirm the changes in writing (by email is fine) and we can make arrangements for you. Call us on 020 7970 4142 and we can set everything up for you. I haven't ordered before, how do I set up my artwork? We need an electronic version of your logo and a sample of your letterhead, then we send you a proof to approve. It's that simple! If you want to add anything else to your personalised section let us know when you place your order. Is there a cost to set up my artwork? There are no set up costs for your first order – all the costs are covered within the price. How do I get a copy of my logo to you? The easiest way is to give us the name and contact number for your designer or letterhead printer and we can sort this out for you. Otherwise if you have a copy of your logo in Illustrator .eps (encapsulated postscript), you can email it to us. I want to write my own article, how many words can I write and how much will it cost? The word counts differ between the newsletter titles. - For Bulletin or Review submit 385 words. - For Financial Focus submit 420 words. - For Money Wise submit 385 words. The option to write your own article is only available as part of our Tailored Service. How do I send in my photo? You can send in a digital photo by email. Digital photos need to be 300 dpi resolution to print sharply. Do you still have a photo/story I used before? We have an extensive archive so we usually will have what you need, but call us and we will check and confirm if we do. Will I receive a proof each edition? Yes, we send a proof of your personalised section every edition for you to sign off before we produce anything. You just need to respond to the proof email in writing to confirm that your artwork is approved before the proof approval deadline. What do I do with the proof? It will need to be approved by the people responsible at your firm. All the details and the positioning of information needs to be carefully checked before you give your approval. Approval should be confirmed in writing once you are happy with the personalised section, or if you want to make changes call us and we will send a revised proof for you to check and approve. I need to make changes to my proof, what is the best way to do this? Just give us a call to talk us through what you want to change and we will create a new proof for you to approve. If you already have a copy of your proof you can mark up the changes on this and send it in to us. What does it cost to make changes to my logo or details? If you need to make any amendments we will produce a second proof for you to sign off, without charge. If you need more proofs after the second proof, a charge may apply per additional proof. The colour on my proof doesn't look right, why is this? Colours on screen are produced out of red, green and black (known as RGB), whereas the print process uses either pantone colours or CMYK. How the colour appears will also vary between different screens as different settings will be applied. The colour result from your office printer will differ from the colour result achieved by a high-quality printing press, and your colours can also be distorted by factors such as toner levels. We will be happy to check the colour for you if you are concerned. What is a pms (pantone) number? Your corporate colours will usually have a reference, known as a 'pantone' or 'pms reference', which is the system designers use to identify the exact colour they have used to create your corporate image. Our firm has corporate guidelines, can we incorporate this into our newsletters? Yes, just send us a copy of the guidelines and we will ensure we set up your personalisation within the stipulations of your guidelines. We are able to provide you with a quote for your specific requirements. We use special paper, can our newsletters be printed on this? Yes, we can print your newsletters on specified paper, however please call us for additional pricing and to discuss. We then order paper stock for your print job, you don't have to do anything else! Is the content compliance checked? Yes all the content is checked by our technical experts, then by our independent compliance consultants and then the compliance departments of the major networks to ensure that the articles are compliant. I am a member of a network, do they check the newsletters? We send the article content to the major networks for checking. Some networks also ask to see your personalised section. Please make sure you tell us when placing you order which network or support services firm you are a member of and we will make sure we are in contact with their compliance department. Do I get a discount for being in a network? We have discount arrangements with some of the networks. Call us for details or see Taxbriefs partners page. Can I split the delivery between two or more addresses? Yes. There is a charge of £15 per extra delivery address, covering a delivery of up to 500 copies. When will my newsletters arrive? For delivery details and dates please call us for a copy of the publication schedule. Yes, call us for details. Is there a version available for my website? We offer newsletters for website and email use in PDF and HTML format. Can I print the content of the digital versions in my own documents? We offer the content under license for printing if you are looking to print the information in your own documents, we will be pleased to provide a quote for your requirements. Can I order an email newsletter? You can order a PDF newsletter and email this to your clients as an attachment. We also offer the Taxbriefs Content Plus Service for email use. Call us 020 7970 4142 for more details.